Unless it’s wintery and cold, I prefer serving salads. You don’t really need to worry about temperatures when serving. And unless you’re doing a grilled salad, they never get cold. Best of all, I could collect a majority of the ingredients during the days leading up to the party and just assemble everything in less than 5 minutes before serving. The theme of the party was summer meets fall. I was excited to find apples and squash peaking their way into the markets but still saw an abundance of greens, heirloom tomatoes and peaches. The dinner moved with the season change, highlighting the corn, peaches and tomatoes in the appetizers then getting heavy into apples and root veggies by the end of the meal. This salad was inspired by a recipe I found on Two Peas & Their Pod. I altered some of the main ingredients a bit and changed the dressing (the original would have been way too sweet for me!). I like goat cheese better than feta and didn’t want too much sweetness so eliminated the cranberries, but added some candied walnuts for crunch. I do wish the roasted apples and squash had a little more crunch to their exterior, but all and all people actually seemed to like this course the best. I’m thinking next time I just serve a giant salad and forget the 4 hour pork braise! Preheat the oven to 400°F. Place the butternut squash and apple chunks on a large baking sheet. Add olive oil, maple syrup, salt and pepper and toss. Roast the squash and apples for 25-30 minutes, turning once, until tender. Remove from the oven and cool to room temperature. You can do this a day or two in advance, just store in refrigerator and bring to room temperature before assembling salad. Place mixed greens in a large salad bowl and toss with several tablespoons of dressing (I like my salad lightly dressed and used about 4 tbsp). Divide salad greens between 8 plates. Add squash and apples to now empty salad bowl and toss with more dressing (another tablespoon or two). Divide between each plate of greens. 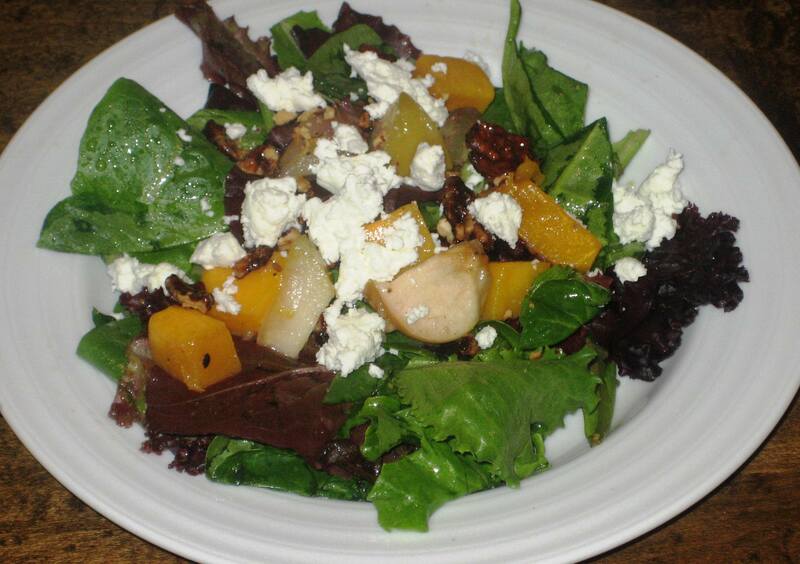 Top each plate with about 1/2 oz candied walnuts and crumbled goat cheese. Serve immediately. Whisk all ingredients well in a small bowl or pour ingredients into a salad jar and shake well until combined. Dressing makes close to two cups so you will have extra! Refrigerate and save for up to two weeks. PS. The recipe above serves 8 side salads, but put it all in one big bowl and you have a hearty dinner salad too!